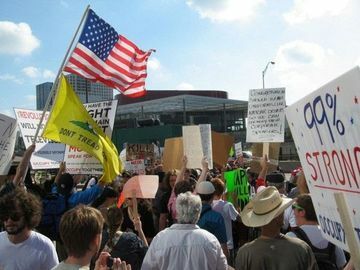 The American Independent - This is one of the better stories about “Occupy Dallas”. 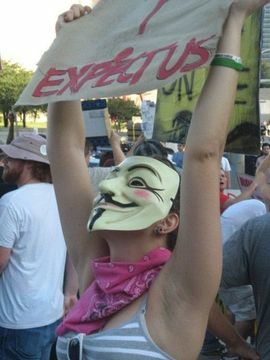 ”…Full of signs and shirts bearing the Occupy Wall Street movement’s “99 percent” slogan, the crowd was also peppered with 9/11 Truth demonstrators and the Guy Fawkes masks of the hacker group Anonymous…. Well done. This reminds me of dealing with the 9/11 truth issue on Roger Ebert's widely read blog, whereby his default response after a couple of long posts detailing some of the problems with the official story was "Very few people think the Bush administration had anything to do with 9/11". When someone quoted Zogby and other polls to him, he returned with links 'debunking' the validity of poll numbers in general. Ebert was in a coma in hospital during the key period when 9/11 truth was really hitting the mainstream, and seems to have thereafter swallowed the 'raving conspiracy theorist' meme hook line sinker rather than taking a proper look at the evidence. He also suffers from what I think a number of high profile journalists do, in that their position within and familiarity with the mainstream makes them unwilling to look at how the media actively blocks and distorts the facts surrounding issues like this. All that said, it serves the powers that be to depict the 9/11 truth movement as 'fringe', when it's now likely anything but. Bogan the Wanderer on Fri, 10/07/2011 - 3:56pm. "Occupy NIST" should be considered? Jon Cole on Fri, 10/07/2011 - 5:16pm. Joe on Fri, 10/07/2011 - 11:40pm. grumpy brian on Sat, 10/08/2011 - 10:05pm. that is sold should be a reasonable indicator for the US Government of how many people are in some way afraid of the policestate but also willing to protest now or in the (near) future. It's difficult to decide what's best to do, I personally can understand why a protester would wish to remain anonymous in this day and age, with all this technology that exists. Other than that, I suppose that if "they" want to track you down, "they" will have no problems with that, so wearing a mask to protect your identity during a protest may be a bit useless. On the other side, it may indeed by a very powerful symbol of resistance, if worn by many 1000's, 100.000's or even million's of people. Other masks could also be worn of course. A mask of Gandhi might be appropriate considering his promotion of nonviolent attitude. Anybody got other ideas? 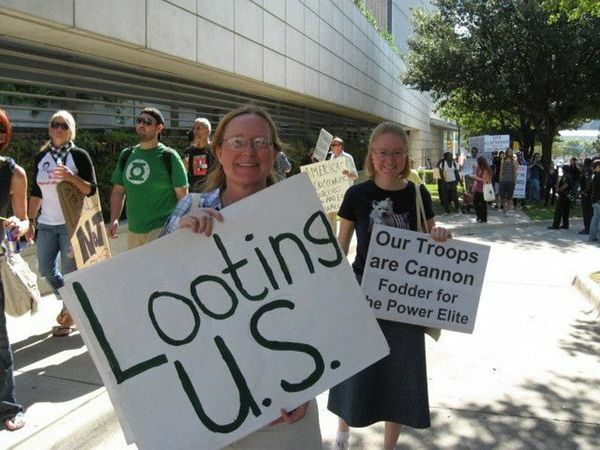 Great to see these protests, where will this end? Sandberg on Sun, 10/09/2011 - 10:29am. We want transparency in Government, right? Anyone practice what they preach? grumpy brian on Sun, 10/09/2011 - 12:04pm. 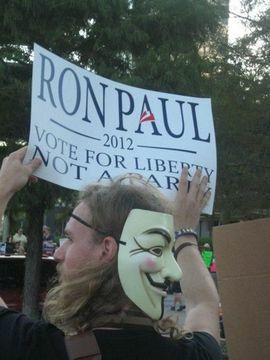 but I don't see a real problem with wearing a mask (preferably all the same one mask) during a protest. It gets all the more easier to not were a mask when there's 100's of 1000's or even millions of people who participate in a protest. But when the numbers are few, I can understand why someone would not want his face exposed. It's all the better of course when one doesn't have this kind of fear, but it could be dangerous of course. In other countries you can be identified while you're protesting and next thing you know your family's kidnapped, your house torn apart etc etc. These things happen, have happened and will happen. We need big numbers for starters, people willing to take to the streets, forget work, don't worry whether they'll get fired or not for not shwoing up but instead go protesting. This is not easy, people really need to be convinced of the necessity to protest first (other things later) if anything is going to be done about this situation we're in, that's not a really fast process. We can only hope that more and more people are inspired by the actions of those we see in the streets right now. So while wearing no mask would be preferred, I think wearing one shouldn't be a problem. Letting some firm make a profit off of the selling of those masks is irrelevant IMHO. Sandberg on Sun, 10/09/2011 - 4:28pm. If a mask helps give someone the courage to STAND UP AND BE COUNTED, then wear a mask. Better than an excuse for inaction. Joe on Sun, 10/09/2011 - 12:27pm. In Mr. Moore's account of his career, the villains are clearly defined: they are the mainstream comics industry — particularly DC Comics, the American publisher of "Watchmen" and "V for Vendetta" — which he believes has hijacked the properties he created, and the American film business, which has distorted his writing beyond recognition. To him, the movie adaptation of "V for Vendetta," which opens on Friday, is not the biggest platform yet for his ideas: it is further proof that Hollywood should be avoided at all costs. "I've read the screenplay," Mr. Moore said. "It's rubbish." grumpy brian on Sun, 10/09/2011 - 2:50pm. Joe on Sun, 10/09/2011 - 3:05pm. ... To demand a new 9/11 investigation. 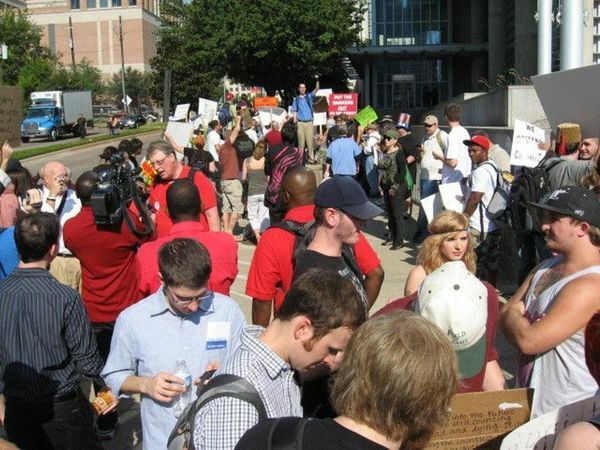 On the heels of the nationwide Occupy Wall Street and Occupy the Fed demonstrations, such activity could generate coverage. A new 9/11 investigation won't happen until the NYC DA and NY AG are pressured into doing so. Aidan Monaghan on Sun, 10/09/2011 - 8:27am. 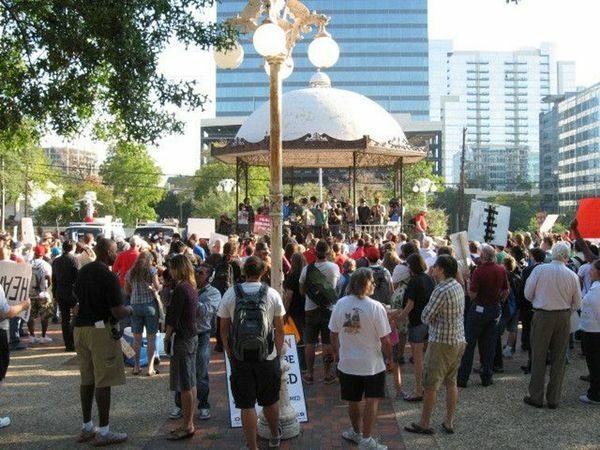 On Thursday, Joe and Rob marched from Pike Park to the Fed. Some people were already at the Federal Reserve waiting for the marchers to arrive. Group member, Dave B wore a barrel. The media loved it. 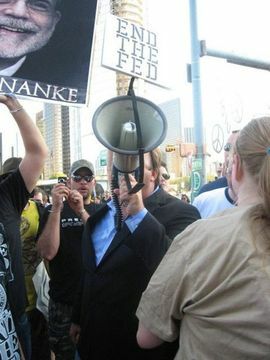 Joe took pictures on Friday, Oct 7, when Alex Jones and End The Fed and Occupy Dallas were all there. You see some of the pics which Joe took above in his comment. 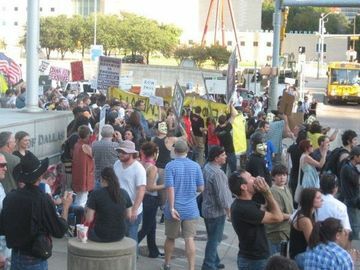 The Dallas Observer wrote an article about Friday's END THE FED and OCCUPY DALLAS which was fair reporting. We are very proud to have Debbie McKee (and daughter Adrienne) as a group members of North Texans for 9/11 Truth. Debbie's integrity is beyond reproach. 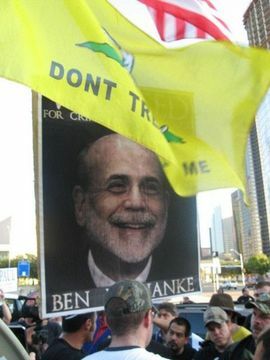 Debbie McKee organizes END THE FED in Dallas and is involved in a myriad of activism issues. She works hard. On Thursday, she was interviewed on the Alex Jones radio show. Debbie McKee sets an example for us all on how to work with people, the police, officials, the media, other groups, and "places we occupy". TomT on Sun, 10/09/2011 - 1:57pm.